I have found myself developing an interest in brutalism, the style of architecture that was predominant in the 1950s, 1960s and 1970s. I have had a slight interest in modern architecture in the past, but I am finding myself increasingly drawn to brutalist structures and other buildings from this era. It is not just the aesthetics of brutalist buildings that draw me. I am more fascinated by people’s interaction with them. It is a puzzle. This is a style of architecture that dominated the scene just a few decades ago. If you view contemporary publicity films about post-war urban development, there is nothing but unflinching optimism (similar to the new towns I posted about a couple of days ago). Telly Savalas looks at Birmingham. “You feel as if you’ve been projected into the 21st century,” he said. But by the time the 21st century came, many people would be itching to demolish the very buildings he was enthusing about. Today, conventional wisdom derides brutalism utterly as carbuncular. Moreover, it is inextricably associated with poorly-maintained social housing, and in turn, crime and deprivation. I was eager to learn more about brutalism, so went to see if there were any books on the subject. I was delighted to find out that a book, Brutalism: Post-War British Architecture by Alexander Clement, has been published very recently. Around half a century on from the height of brutalism, now is a good time to look back at the style with, as the blurb describes, “a degree of rational reappraisal.” I am really glad to have found this book, which documents many of the notable brutalist buildings in Britain. Speaking personally, I felt as though this book could have been a bit more accessible to someone like me, who has almost no prior knowledge about architecture. But I doubt there are too many people like me — relatively new to architecture, but interested specifically in brutalism — so I can understand this. Besides, it didn’t prove to be too much of a barrier to my enjoyment of this book. The reader is taken on a whistle-stop tour of brutalist buildings. Public buildings, universities, service stations, office blocks, churches and, of course, social housing, are all covered in turn. The success of the book rests on the wonderful photographs. These vary in quality, but are often very striking, demonstrating the awesome magnificence of these buildings. But the book focuses too much on the architecture. This is probably an odd thing to say about an architecture book. But people’s interactions with brutalist architecture — positive and negative — are such an important part of the story, and are what drive my interest in the subject. I would have liked there to have been more on the background behind brutalism. Deeper explanations of the theories and ideas behind concepts like streets in the sky and other brutalist hallmarks would have been useful and interesting. A deeper exploration of the criticisms of brutalism would also have been welcome. I wanted to learn more about the other side of the story. Inadequate, poorly or cheaply-built buildings, that age badly in the British climate, and don’t cater for humans properly, are frequent criticisms of brutalism. While these aspects are all mentioned, their treatment is brief. This left me slightly disappointed and wanting to learn more than the book was giving me. The book focuses almost exclusively on the positive sides of brutalism. This may be expected, and the author seems to be on a mission to improve the image of brutalism (and why not?). But it did leave me feeling as though the full story hadn’t been told. Overall, though, I am really glad to have found this book. 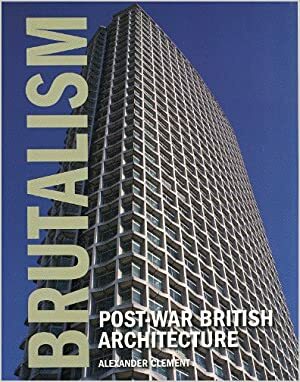 It has taught me a lot about brutalism, and has inspired me to think again at buildings I already knew, and also to view in person some of the magnificent buildings featured in the book. Brutalism: Post-War British Architecture is a brilliant document of an important style of architecture that sometimes seems as though it’s in danger of being completely wiped out by a generation that cares nothing for it.